Our team building experience is a unique and insightful experience like no other. Employees are grouped into teams of 4-7 people and are challenged for 45 minutes to bust out of our escape room experience. Regardless of the outcome after 45 minutes, the team is released and taken to a conference room to discuss what happened. Each team is paired with one of our expert consultants who facilitates a conversation that makes you rethink the way you interact as a team. After completing the team building experience your team is left with an energy in the room that causes everyone involved to evaluate their communication style, role, and unique strengths in the company. This memorable experience is often the catalyst for positive changes in your company’s culture and its individuals. 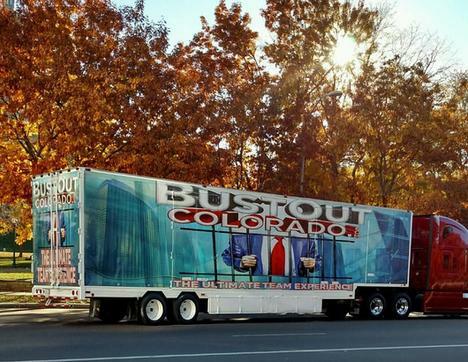 There is no doubt that BustoutColorado brings a team building experience not found in any other venue. Our team buiding experience is uniquely designed to come to you. Built within a state-of-the-art semi-trailer, we can drive to your location or set up wherever you’d like. Our unique experience is offered at three different levels, each customized to your exact needs. Please see the Pricing page for a description of our Facilitated Event, a Fun Event or our Premier Event which combines the DiSC personality profile with the Escape room learning. We provide 2 business consultants with decades of experience across multiple industries to speak and discuss the experience. This discussion amplifies your teams success and failures in a way that creates memorable and motivating insights that carry over into their every day work life and culture. Your team of 4-7 people are placed into our 1960’s jail cell and charged with a crime they didn’t commit. Immersed in a dark and damp 1960’s jail cell, your only hope is to try to escape. It’s up to you and your team to work together using only what is provided in the jail cell and your team work, to bust out before the jailer returns from his 45 minute patrol. Your life depends on it. This is more than just fun and games. While the team is inside, our live camera feeds capture the experience and provide key insights to the way the team functions as they attempt to bust out. After the time is up, the team adjourns to the conference room where a deep conversation begins. Each team is engaged in a discussion facilitated by two expert consultants that communicate what they saw behind the scenes and how it applies to their job role or culture in the company. This is where the team building experience goes from a fun 45 minute event, to lasting change. It can only be experienced in person and is what makes Bustout Colorado an incredible team understanding and team building experience. A better understanding of what you (the employee) should bring every morning when you come to work.